The National Weather Service in Seattle has issued another Winter Storm Watch. This Winter Storm Watch is effective from Sunday, February 10th through Tuesday, February 12th for much of the Puget Sound region, including the Snoqualmie Valley. In anticipation of adverse road conditions and severe weather conditions, Snoqualmie Valley Transportation will not be in operation on Monday, February 11th. If you have a ride scheduled it is canceled. We will evaluate conditions on Monday to determine if we will resume operation on Tuesday 12th. Make sure to watch our Facebook Page and our website www.svtbus.org. We will be making updates as conditions change. Due to hazardous road conditions on Big Rock Road, the Valley Shuttle will bypass Big Rock Road and use Highway 203 from Stillwater Chevron to the Duvall Safeway. Due to a damaged tire, the Monroe Loop Shuttle will be delayed starting the 9:45 route. The shuttle should be back on route by 11:15. September 14th (Friday) the 7:55 pm southbound from Duvall will be detoured leaving Carnation at NE Tolt Hill Rd and return to the route at the Fall City Library. This detour will force the route to be approximately 10 minutes late to the Fall City Library. September 17th (Monday) the 5:35 am northbound from Fall City will detour after the Fall City stop at SE Redmond Fall City Rd & 337th Place SE. 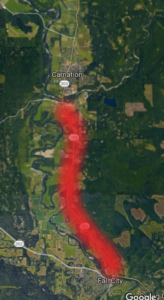 The bus will return to the regular route south of Carnation. 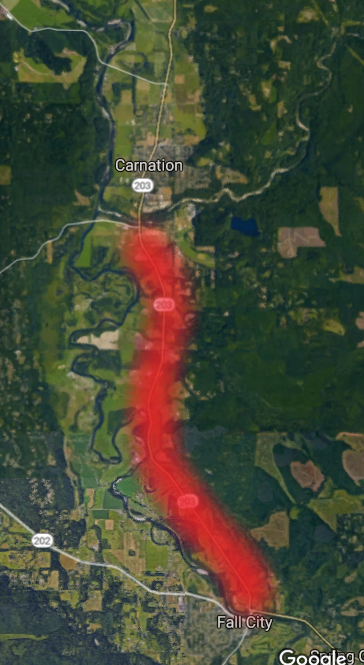 This detour will force the route to be approximately 10 minutes late coming into Carnation. If you have any questions or concerns call us at 425-888-7001. Author Carole HillPosted on September 14, 2018 Categories DO NOT USE THIS CATEGORYLeave a comment on Valley Shuttle Rider Alert! Due to a bank robbery at the North Bend Bank of America on the corner of Bendigo Blvd. S. (202) and W. 2nd. St., our buses need to reroute around the area. 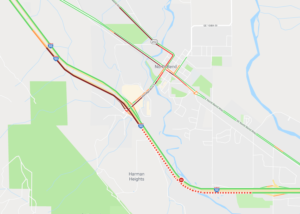 If you are trying to reach our Downtown Loop bus into Snoqualmie from the North Bend Library stop, please walk to the corner of W. 3rd St. and Bendigo Blvd N. We will go back to our usual route when the situation clears up. Thanks for your patience. Routes are being affected adversely. Expect delays because of the heavy congestion in North Bend. Thank You 4:20 P.M.
Due to ongoing road work, the Cedar Falls Loop is running between 10 to 20 minutes behind schedule. Please call 425-888-7001 to find out the current status.